Thirteen Idaho charter schools will need to improve academically if they want to continue operating. The Idaho Public Charter School Commission (PCSC) has imposed a range of academic sanctions, or “conditions,” on 13 of its 25 charter schools up for renewal. Low-performing schools sanctioned by the PCSC underscore the wide range of student achievement in Idaho’s charters, which also consistently rank among the state’s highest performing schools. For example, 51 percent of PCSC charters yielded a higher percentage of students achieving proficient or advanced scores in the math portion of the 2015 ISATs than students throughout the rest of the state. Also, 66 percent had a higher percentage of students achieving proficient or advanced scores on the English language arts portion of the test. It’s largely Idaho’s virtual charter schools that are under-delivering, dragging down the state’s performance indicators. When Idaho’s latest graduation rate report remained unchanged from the year prior, state superintendent Sherri Ybarra pointed out that 36 percent of the state’s high schools posted graduation rates of more than 90 percent. She also said virtual and alternative high schools posted the state’s lowest graduation rates. State education leaders do not impose improvement conditions on low-performing traditional schools, and charters flagged by the PCSC have up to three years to either meet their prescribed academic conditions or face the possibility of closing their doors. PCSC director Tamara Baysinger last month defended the renewal conditions, which are aimed mostly at boosting lagging standardized test scores and high school graduation rates. “It is important … that we strike the right balance between ensuring that the schools we authorize offer high-quality options to Idaho students,” Baysinger said. Some charter school leaders take issue with data fueling the prescribed conditions. Others say the sanctions are a tough yet necessary price to pay in states that welcome charter school development. “You will eventually be called out and held accountable for your performance,” Ryan said. The PCSC is Idaho’s largest public charter school authorizer and is responsible for 41 schools, or about 73 percent of the state’s charters. Almost 17,000 students attend PCSC schools, whereas another 4,200 attend charters governed by districts. In all, Idaho public charter schools account for roughly 7 percent of statewide k-12 enrollment. Richard McKenna Charter School in Mountain Home. Syringa Mountain School in Hailey. iSucceed Virtual High School in Boise. Another Choice Virtual School in Nampa. Idaho College and Career Readiness Academy (previously Idaho Technical Career Academy) in Meridian. Heritage Community Charter in Caldwell. Idaho Virtual Academy in Meridian. 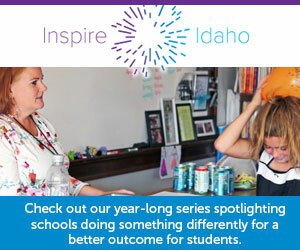 Inspire Connections Academy in Boise. Idaho Science and Technology Charter School in Blackfoot. North Valley Academy in Gooding. The Village Charter School in Boise. The PCSC’s 2017 performance report outlines criteria used for imposing renewal conditions. Twenty PCSC charters require either academic “remediation” or “critical” academic intervention due to low standardized test scores, low high school graduation rates or lagging student growth. Schools operating in these categories “may be renewed, conditionally renewed, or non-renewed, depending on the specifics of their situations,” Baysinger said. ISAT math scores: According to the report, 17 of 36 PCSC schools trailed the state average in ISAT math proficiency in 2017. Ten of these schools trailed the state average by at least 15 percentage points. High school graduation rates: Eight of 17 charters trailed the state-average high school graduation rate in 2016. Seven of these schools trailed the state average by at least 25 percentage points. PCSC virtual charters particularly struggled in these areas. Six of seven virtual charters up for renewal have incurred sanctions requiring improvements. The 2017 report stresses that schools serve different populations and, therefore, require different interventions. Idaho Virtual Academy (IDVA) head administrator Kelly Edginton questioned whether PCSC consideration for virtual schools goes far enough. The PCSC weighs data from students enrolled from the first eight weeks of the school year through the state-approved spring testing period. Edginton says half of IDVA’s roughly 1,800 students are new to the school each school year and need more time to adjust. “Schools with higher mobility are at a disadvantage compared to traditional schools with low mobility,” Edginton said. Bluum’s Ryan said higher rates of mobile students drive academic hardships but accountability is still necessary. Ryan said renewal conditions for public charter schools weed out those that should close due to low performance or lack of proper oversight. He also acknowledged the wide performance gaps among Idaho’s PCSC charter schools and pointed to Idaho State Department of Education data showing that, on average, charters still outperform traditional schools in Idaho. “If you look at these schools like one big school district, they’re still doing pretty well,” Ryan said. Disclaimer: Idaho Education News and Bluum are funded by the J.A. and Kathryn Albertson Family Foundation.